The sequence of events that precedes someone becoming a resident of Eureka Springs can take many forms. For Mamie Kincaid it started with an article in the Ford Times magazine that mentioned Eureka Springs. Mamie and her late husband, Paul, had ordered a new white 1965 Mustang and knew the day it was coming off the assembly line. No one knows what led them to want a Mustang, which was a newly released model by Ford Motor Company. When Paul died in Klamath Falls, Oregon in 1966, Mamie, who hadn’t driven a car since the 1920s, signed up for a two-week driving course to learn to drive her sports car. The 58-year-old widow first moved to Mesa, Arizona, where her sister Kay lived, but then read of Eureka Springs. She and Kay made a trip to visit in the spring of 1969. The trip must have been a success, because after a phone conversation with her daughter, a house, barn and acreage were purchased on top of Busch hill near Hunt’s log cabin. Mamie with her 1965 Mustang and her sister Kay with her 1957 Chevrolet moved into the home and awaited the arrival of daughter Gail. In July 1969, Gail arrived with her 1963 Chrysler 300 Pacesetter convertible, three sons, horse and cat. Gail was out on the mountain for two-weeks before she made the trek into town. “What a surprise Eureka was,” she told me. “Not that it was doing much.” A die hard Oregon native, Gail has always had mixed feelings about being in Arkansas. She said her horse disliked it here from the start, not liking the thick brush or the copperhead snakes. Mamie Kincaid and her family didn’t stay out on the mountain, though, as they all moved into town at different times. Many will remember that white 1965 Mustang parked at 215 Spring Street for many years and it hasn’t left the family as her grandson Scott Schmitz now has it. Sister Kay took an apartment in Col. King’s house and worked at the Hallmark Shop on Spring Street. What became of her 1957 Chevrolet is not certain. Gail sold the 1963 Chrysler convertible, but 13 years later was able to buy it back and has now fully restored it. If you keep your eyes open, you’ll see her in it from time to time. 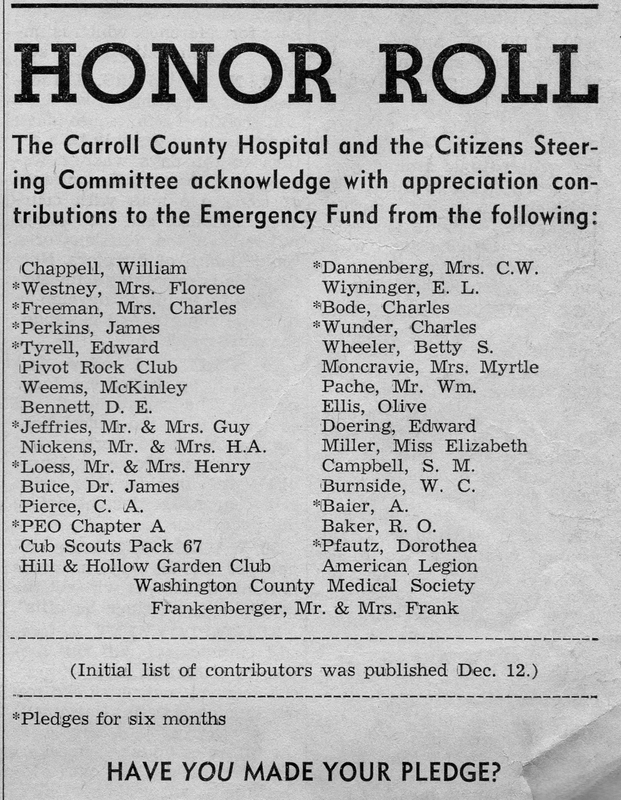 This advertisement is from page 7 of the January 2, 1964 edition of the Eureka Springs Times-Echo. The hospital referred to is the one located in Eureka Springs. Zelpha Long told this story about sledding in Eureka Springs and said I could repeat it. Speaking of Eureka Springs sledding weather, George Nichoalds, who operated the local weather station for more than four decades, recorded an especially interesting stretch of winter weather in January of 1918. During three weeks, 20 inches of snow and ice fell and on the twelfth the temperature dropped to minus 17 Fahrenheit. As far as I can find, that is still the record low temperature for Eureka Springs in modern times. The other morning here in the hollow, my thermometer recorded a low of minus five° F and that felt plenty cold. My brother-in-law has a friend from Iceland, a man known locally as “The Viking.” The Viking says that once the temperature drops below zero, it all feels the same. Since my experience with sub-zero temperatures is irregular and limited, I’ll defer to him. By the way, the original Eureka Springs weather station was established April 21, 1902 by the U.S. Department of Agriculture Weather Bureau and in 1910 George Nichoalds volunteered to run it. He recorded a lot of weather here, not retiring from the position until 1953. Apparently a person prone to stick with something, George also worked several decades for the Eureka Springs Post Office. Mr. Nichoalds died in 1968 and is buried in the Eureka Springs Cemetery. A fixture in Eureka Springs for six decades, George Paul O’Connor was born in Marcus Hook, Penn., and grew up there and in North Dakota. Following work in the 1920s, he and a friend made their way south to Eureka Springs where George settled down and married Norma Fioravanti. Norma O’Connor clerked at the Eureka Drug Company for 26 years. I knew George only after the ravages of Alzheimer’s, but have heard stories of his keen, active mind. Staunchly independent and opinionated, while reading the newspaper or a book (even an encyclopedia), he would underline and make notes in the margin, sometimes vehemently disagreeing with the author’s viewpoint. 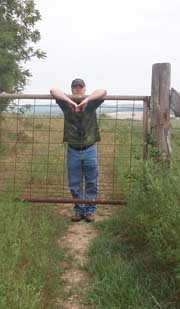 For decades he lived just out of the city limits on U.S. 62 (his address was Route 1, Box 2) and when the city of Eureka Springs annexed his land he joined a lawsuit with other landowners. Though they lost the suit on appeal, George O’Connor and what he thought comes shining through when you read the opinion. Besides opening the Texaco Service Station in 1950, he served as a Justice of the Peace on the Carroll County Quorum Court and was a highly skilled carpenter, known for his steep roofs. O’Connor’s Texaco is now the long-time location of Sparky’s Roadhouse Café.